Flexis are cool. People don’t make them that much any more, as far as I know. Maybe it’s difficult to make them these days. Maybe I should investigate, and if I can, just make a flexi for the hell of it. And hey, if I did, it might be like this one, as it’s a good one. Not only does it involve Hood, everybody’s favourite band that nobody has heard of but who are really very good indeed, but also Hula Hoop, who I remember did an excellent split album with Boyracer, and Blairmailer, who I remember were something of a big (indie) deal in Australia in the early nineties. This flexi came free with a fanzine called Open Your Eyes, amongst other things – back in the crazy early nineties there were all kinds of hook-ups and cross-promotional activities going on, with flexis being given out free with several fanzines, fanzines given out free with flexis, and so on. That fanzine was very, very well written and I distinctly remember it as being the first place I ever read the phrase ‘post-rock’. This may not mean much now, as the phrase is attached in one way or another to pretty much every independent band that doesn’t sound like Coldplay of the past ten years. But it was a strange and mysterious new phrase back then – which I think was attached to not what you might expect (the often-referred to as ‘slowcore’ of Slint, Codeine etc) but instead to the gliding modern swoops of Trans Am and the noisy tension of Rodan. Actually, Rodan were kind of post-rock-meets-slowcore, but there I’ll end my categorisations before I tie myself in pointless pigeonholing knots. 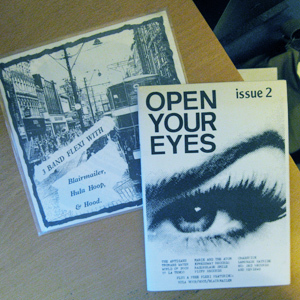 I’ve actually got several copies of both Open Your Eyes and the associated Hula Hoop/Hood/Blairmailer flexi – for reasons I can’t exactly remember; but very possibly due to my vague plans once to act as an independent distributor and hence buy in several copies of a thing in order to sell it on (for no profit, by the way) after that. Anyway. If anybody reading this wants a copy and can stump up a couple of quid to cover postage, let me know, and I’ll ‘hit you up’ as they say. I might be tempted by a Hood flexi (they’re just a poor imitation of Bark Psychosis though no :-)).